Play is $40/person with a minimum of 10 people in the group OR $25/person with our Advance Planner Rate. Call or Email us for details. 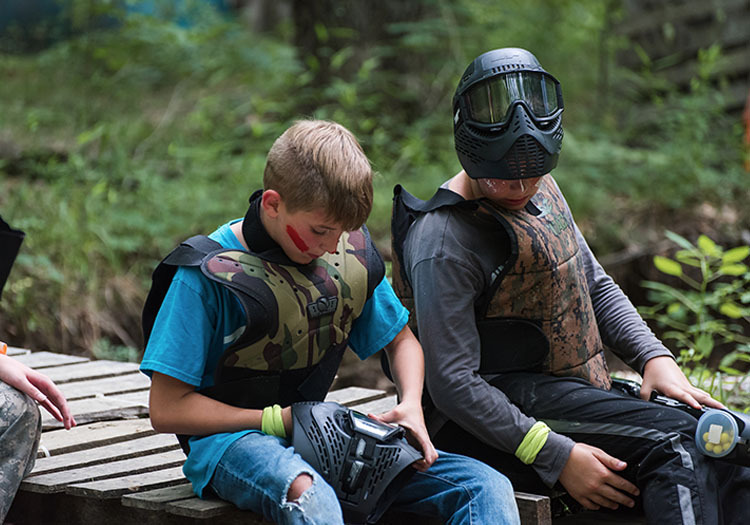 NOTE: If you are attending one of our summer camp programs that is offering paintball, the cost is only $20, but play may be limited to 2 hours or as camp schedule allows. 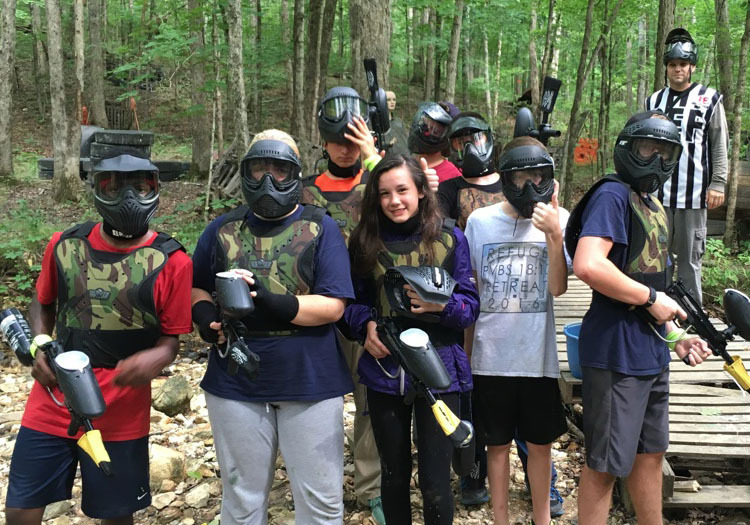 We offer opportunities to play paintball any day of the week. Availability is based on our retreat groups that are using the camp. 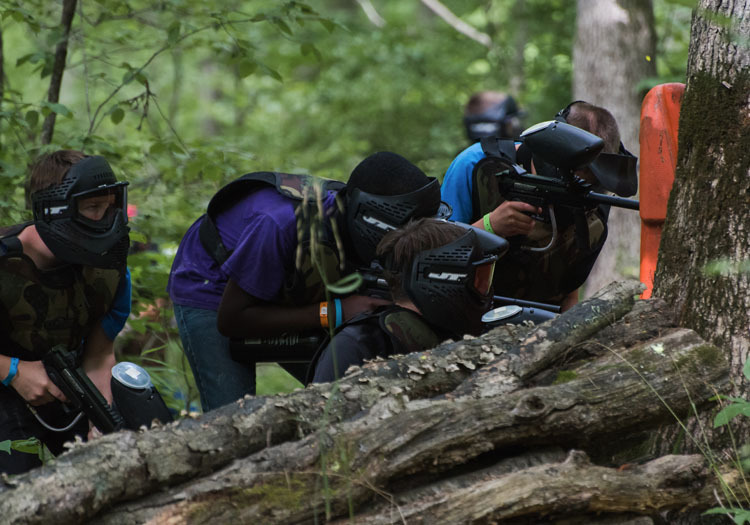 However, most of our retreat groups do not opt to play paintball, so the course is generally available on weekends. You can fill out our reservation form to check if the dates your group would like to play are open – simply click the button below. NOTE: Temps must be above freezing to allow gameplay. All players must have a signed liability waiver in order to play. ANY PLAYERS UNDER THE AGE OF 18 MUST HAVE A PARENT/GUARDIAN SIGN A LIABILITY WAVER/PERMISSION FORM. Click HERE to download the form. Completed forms may be brought with you to camp. A. It’s a sport in which a bunch of people go out in the woods and relive their childhood by playing capture the flag. Only, in this game each player has a marker that fires gelatin capsules filled with a water-soluble marking dye. If you’re shot and marked, you’re out of the game and have to wait until the next one starts. The most common variation is two teams at opposite ends of a section of terrain, each with a flag hung at ‘home base.’ The object is to go get the other team’s flag and bring it back to your base. When you encounter people on the other team, you try to tag them out before they get you. Pretty simple and lots of fun. Q. Does it hurt when you get shot? A. The paint pellets break open upon impact, and generally cause very little pain. What pain is experienced is more of a stinging sensation from the pellet’s impact against the skin or through clothing, that is why baggier clothes and layers are better. If you get hit by a paintball fired from close range (about 20 feet or less) it does sting a bit. Most people will tell you that after the first time you’ve been hit, the sting is rarely an issue. Q: Is there a minimum age for kids wishing to play? A: We do not have a set minimum age, but our recommended age is 10 and older. We leave it up to the parent/guardian to decide if his/her child is mature enough to play. We require that a Waiver/Liability Release Form be signed by parents/guardians whose children are under 18 years old. Paintball is a very safe sport as long as our simple safety rules are followed. 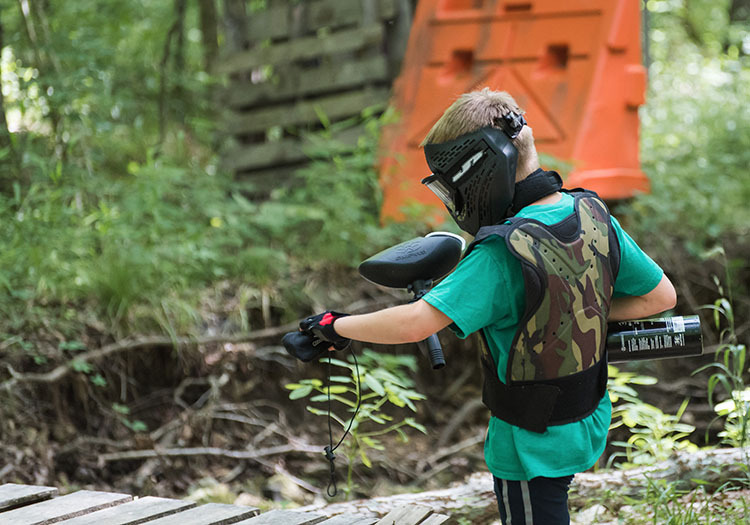 If in doubt, please give us a call, and you can decide if paintball is the right sport for your child. Q: Is paintball a safe sport? 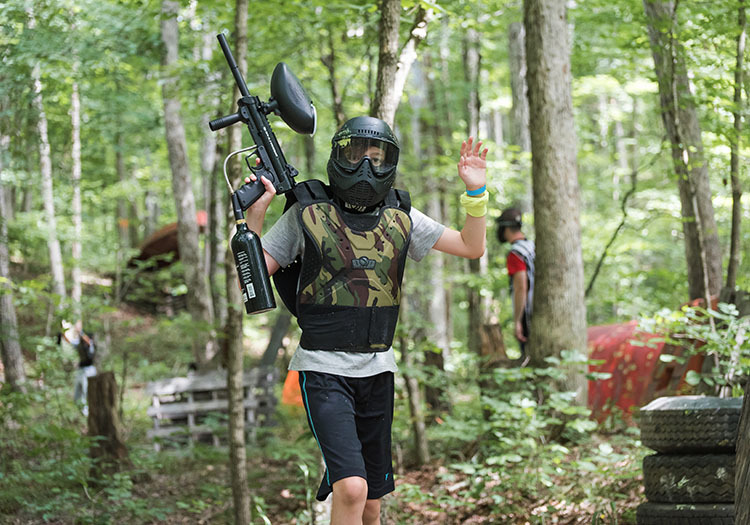 A: Paintball is one of the safest sports and statistically has the least number of injuries of all sports – which include baseball, bowling, fishing and many other sports. As with any other sport/activity, there is always the potential for injury. As long as standard safety rules are followed and the proper use of industry developed & approved safety equipment is utilized, paintball is one of the safest, participatory sports in the world. A: Players should wear old comfortable clothing (ex: military pants, sweat pants and shirts, overalls, denim, etc). Dark clothing is best. Do not wear your nice clothes, you will get DIRTY!! DO NOT wear any good jewelry/watches of any type. If you choose to wear them, they could become lost or damaged. You may also want to bring a change of clothes for the conclusion of the game day. The most suitable footwear would be a light boot but old running shoes are most commonly worn. Cleats are NOT allowed. Q: Can I bring my own paintball marker? A: Yes! However, we will have you regulate your marker to match our markers’ fps. Q: Can I bring my own paintballs? A: No. We provide paintballs with your playing fee, and you can purchase additional balls if needed. Extra paintballs are $5 for 100, $15 for 500, $25 for 1,000, and $45 for 2,000. Q. How many people do we need to have our own private group? A. You need to have 10 or more or pay for 10, and normally the more you have the more fun it is. However, if you are already using High Hill for a retreat, there may be exceptions for group size. Q: I don't want to play, but I'd like to watch. Is that allowed? A. Yes, our field has netting around it where you may safely watch from the sideline. Q.Can I get the paint out of my clothes? A. Paint is water soluble and should wash out as normal. A: There are many different types of games played including “capture the flag,” “elimination,” “El Presidente,” “the Alamo” etc. Games usually last between 15 to 20 minutes. Sometimes they last only 5-10 minutes! Any other questions? Call us at 636-585-2262 or email us.